This year, the Phillies are sending four All-Stars to Arizona with a possibility of a fifth if Shane Victorino can win the final vote. Cole Hamels, Roy Halladay, Cliff Lee, and Placido Polanco will all wear the red pinstripes next Tuesday and all are veterans of the Midsummer Classic; Hamels and Halladay have represented the Phillies once each, while both Lee and Polanco represented different teams in the American League after being traded, but before being reacquired, by the Phils. 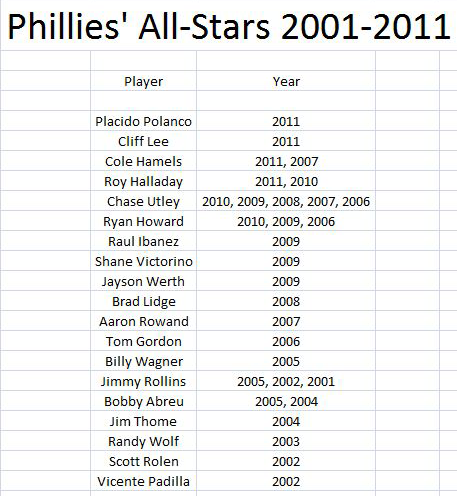 Four Phils All-Stars would be the most since they sent five in 2009 and Victorino’s inclusion would match that mark. It is only the 2nd time in the last 10 seasons that the Phillies will send four players to the All-Star game. If Victorino is voted in, it will match the record for Phillies All-Stars in a single game, matching efforts of 2009, 1995, 1981, 1979, and 1976. 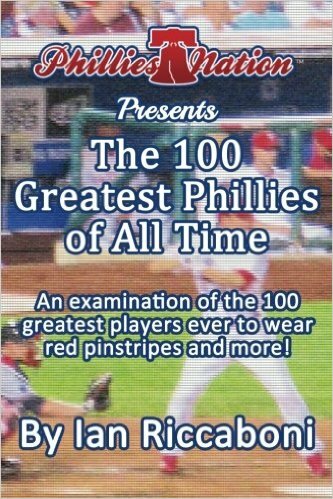 Of the 29 former All-Stars acquired, only 7 made the All-Star team with the Phillies after being acquired while both Dave Hollins and Ricky Botalico had previously made the All-Star team with the Phillies and were later reacquired. Of the players acquired, only a few were reasonably expected to be All-Stars. The Phillies got as-advertised players with Halladay, Lee, Jim Thome, Brad Lidge, and Billy Wagner, while Tom Gordon was a bit of a pleasant surprise. While Jose Mesa did not make the All-Star team with the Phillies after being acquired, he pitched very well as the Phillies’ closer. Jose Contreras has exceeded expectations and has been excellent out of the bullpen and Jamie Moyer was a pivotal part of the Phillies’ transformation into a World Series club. Some of the players acquired, including but not limited to Ronnie Belliard, Luis Castillo, Mike Sweeney, and Jeff Conine were no-harm, no-foul acquisitions while others cost the Phillies players who would mature into top talent. 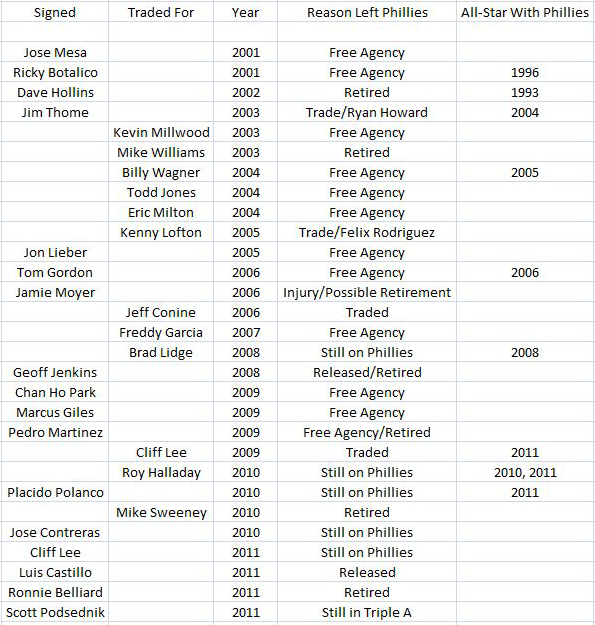 Of those players, the Phils have since reacquired Lee and only Michael Bourn and Gio Gonzalez appear to be long term assets that would help the Phillies in 2011 and beyond. 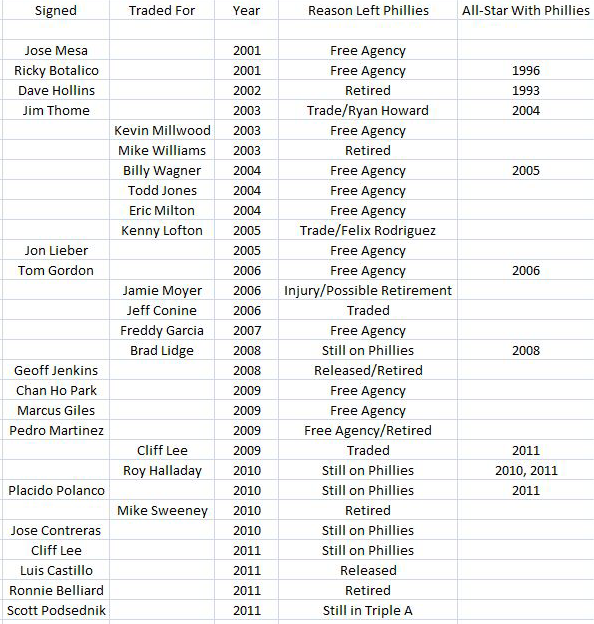 Between 2001 and 2011, the Phillies have seen the departure of most of the All-Stars that they have acquired, but the positive take-away is that in recent years, they have been able to retain the All-Stars that have been the most productive from their own system. They haven’t traded away too many future All-Stars and the ones of value that they did, they either received an All-Star in return or the verdict is still out. 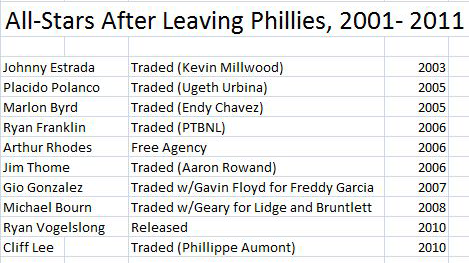 Some trades have been better than others and their are two major clunkers that stick out that luckily did not sink the Phillies and were the right moves at that time: the 2006 trade of Bobby Abreu and the 2007 trade of Gio Gonzalez and Gavin Floyd for Freddy Gonzalez. The Thome for Rowand swap in 2006 filled a need and opened up a spot for Ryan Howard, while the Michael Bourn trade addressed the closer and utility roles that ultimately helped win them a championship.